This book presents a wide-ranging and important collection of new work on gender history. It includes a variety of international contributions which provide the reader with a global perspective on how gender history has developed and where it is going. The subjects covered include gendered space, colonial identites, biology and science, politics, citizenship and the public shere, work, family, and oral history. Ranging from Europe to Asia, Australia to North and South America, together the essays provide an essential guide to the recent and future direction of gender history. 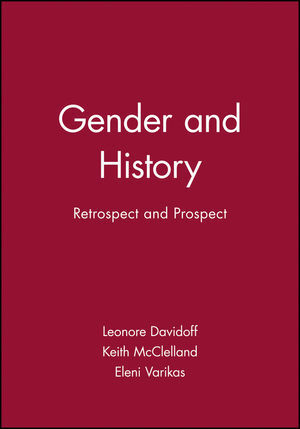 Leonore Davidoff, the founding editor of Gender & History, is Research Professor in Social History, University of Essex. She is the author of numerous works in gender history including, with Catherine Hall, Family Fortunes (1987), and The Family Story (1999) with Megan Doolittle, Janet Fink and Katherine Holden. Keith McClelland teaches history at Middlesex University, London, is co-editor of Gender & History, and is the author with Catherine Hall and Jane Rendall of Defining the Victorian Nation (2000). Eleni Varikas teaches in the Department de Sciences Politiques, Universit7eacute; de Paris VIII and has written widely on the history of political thought and social theory, on gender history and on Greek women's history. Introduction: Leonore Davidoff, Keith Mcclelland and Eleni Varikas. 1. Woman in Nineteenth-Century America: Christine Stansell (Princeton University). 2. Silences Broken, Silences Kept: Gender and Sexuality in African-American History: Michele Mitchell (University of Michigan). 3. Giving Masculinity a History: Some Contributions from the Historiography of a Colonial India: Mrinalini Sinha (Southern Illinois University At Carbondale). 4. The Gender of Militancy: Notes on the Possibilities of a Different History of Political Action: Marco Aurelio Garcia (Universidade Estadual de Campinas). 5. Women and the Public Sphere: Jane Rendall (University of York). 6. The Difficulties of Gender in France: Reflections on a Concept: Michele Riot Sarcey (University of Paris VIII). 7. The Body as Method? Reflections on a Concept: Kathleen Canning (University of Michigan). 8. Gender and Science: Ilana Lowy (Institut National de la Sante et de la Recherche Scientifique). 9. Work, Gender & History in the 1990's and Beyond: Efi Avdela (University of Athens). 10. Close Relations? Bringing Together Gender and Family in English History: Megan Doolittle (Middlesex University). 11. Gendered Space: A New Look at Turkish Modernisation: Ferhinde Ozbay (Booazici University). 12. Paradoxes of Gender: Writing History in Post-Communist Russia 1987-1998: Irina Korovushkina (University of Essex). 13. Conceptualising Gender in a Swedish Context: Asa Lundqvist (Lund University). 14. Gender and the Categories of Experienced History: Selma Leydesdorff (Belle van Zuylen Onderzoeks Instituut). 15. Writing Gender into History and History in Gender: Creating a Nation and Australian Historiography: Joy Damousi (University of Melbourne). Reflects the diversity of work in the field. Shows the range of approaches to the study of gender. Includes a wide range of international work.